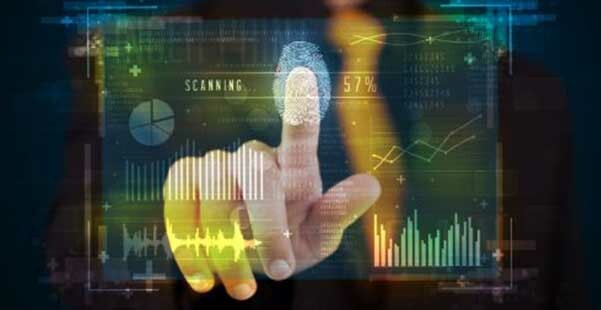 Our Time & Attendance and Access Control systems are based on fingerprint scanning using Biometric technology. Whether you are a private organization or governmental agency you require a company to deliver quality projects, reliable solutions, on schedule and within budget. What is BIOMETRIC Time & Attendance? 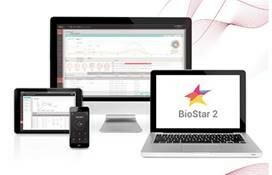 BioStar 2 TA is a time and attendance module that serves as an add on to the BioStar 2 platform. The BioStar 2 TA module provides comprehensive time and attendance functionalities to BioStar 2. Combined with user-convenient features such as time card calendar view and overtime rules, BioStar 2 TA simplifies complicated time and attendance management by offering flexibility for diverse applications. 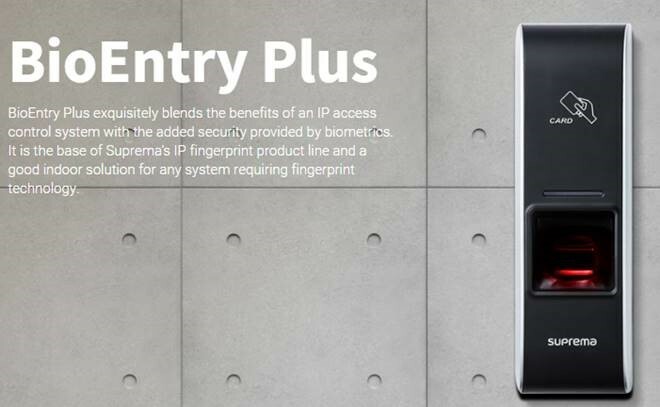 BioEntry Plus exquisitely blends the benefits of an IP access control system with the added security provided by biometrics. It is the base of Suprema’s IP fingerprint product line and a good indoor solution for any system requiring fingerprint technology.applications. Suprema BioEntry R2 is a Compact RFID card & Fingerprint Reader exclusively designed for the centralised access control systems. 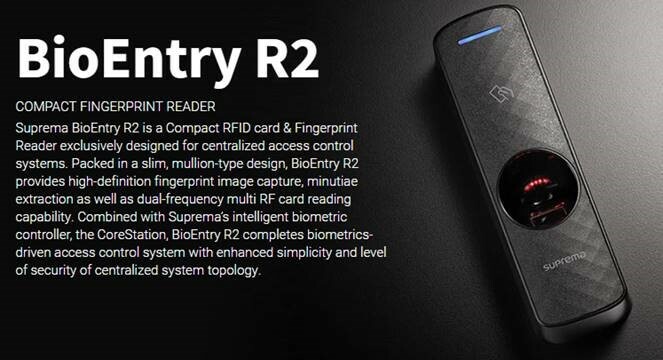 Packed in a slim, mullion-type design, BioEntry R2 provides high-definition fingerprint image capture, minutiae extraction as well as dual-frequency multi RF card reading capability. Compinded with Suprema’s intelligent biometric controller, the CoreStation, BioEntry R2 completes biometrics-driven access control systems with the enhanced simplicity and level of security of centralised system technology. 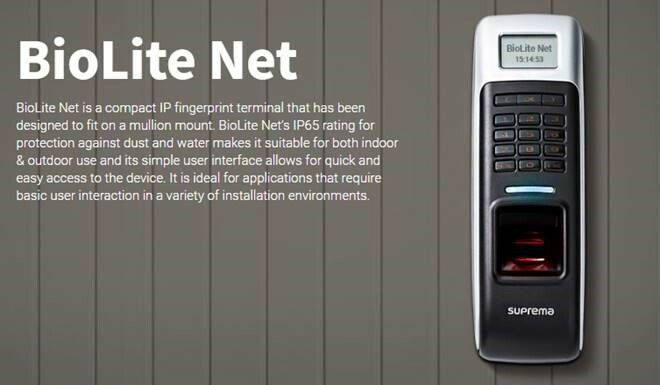 BioLite Net is a compact IP fingerprint terminal that has been designed to fint on a mullion mount. BioLite Net’s IP65 rating for protection against dust and waater makes it suitable for both indoor & outdoor use and its simple user intergace allows for quick and easy access to the device. It is ideal for applications that require basic user interaction in a variety of installation environments. Outdoor Ip Fingerprint Terminal. 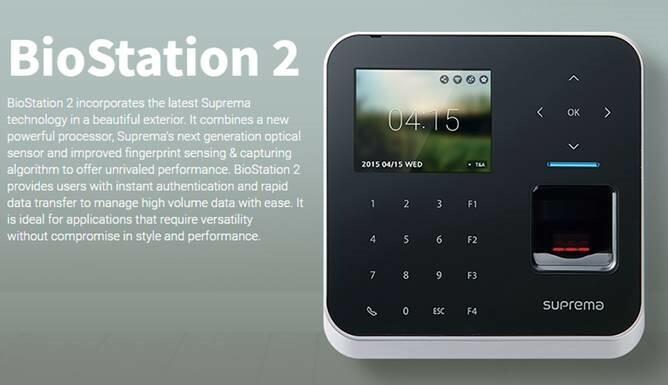 Suprema BioLite N2 is a Suprema 2nd generation outdoor fingerprint terminlal that provides comprehensive access control and time attendance features based on Suprema’s latest biometric technology and security platform. 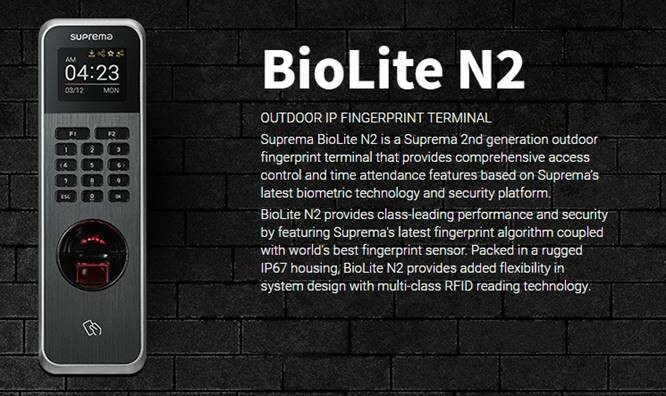 BioLite N2 provides class-leading performance and security by featuring Suptrema’s latest fingerprint algorithm coupled with world’s best fingerprint sensor. Packed in a rugged IP67 housing, BioLite N2 provides added flexibility in system design with multi-class RFID reading technology. BioStation 2 incorporates the latest Suprema technology in a beautiful exterior. It combines a new powerful processor, Suprema’s next generation optical sensor and improved fingerprint sensing & capturing algorithm to offer unrivaled performance. BioStation 2 provides users with instant authentication and rapid data transger to manage high volume data with ease. It is ideal for applications that require versatility without compromise in style and performance.